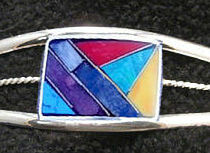 This german silver inlaid cuff bracelet has seven different semi-precious stones in a Zuni inspired inlaid pattern. This silver wire bracelet measures 1" wide (2.5cm) at the widest point on the front face and tapers to 3/8" (1 cm) in back. This inlaid stone cuff bracelet measures about 2 5/8" (6.7 cm) in diameter, measuring from side to side on the longest side. One size fits all. This wire cuff bracelet is adjustable by squeezing SLOWLY in or out. Hand Made. - We have multiples of this design. While no two stones are going to be exactly the same, they are very similar to the one pictured. This item can be combined with other styles in this category that are the same price to qualify for quantity discounts. Our shopping cart will automatically adjust prices to the correct discount levels at check out or when the next quantity discount level has been reached.